At Savannah Christian Preparatory School in Savannah, GA, high school students aren't staring out the window thinking about the future. Thanks to an elective course the school introduced last fall, they're learning the rudiments of a field that, for many, may well be the future. Taking the concept of 21st century skills to a new level, SCPS offers a course to students in its senior high school as a way of introducing them to the building blocks of the technological world. The official course title is "Computer Aided Design," and, strictly speaking, that's what it is. But in requiring of its students the creativity and innovation inherent in developing new products and improving existing ones, the course is more accurately described by the unofficial name used around the school: digital manufacturing. Students Katie Staples and Abigail Dorman work collaboratively on their problem-solving project. 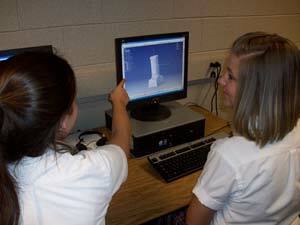 Taught by a former Pentagon missile defense engineer, and using a software application employed by several professional engineering firms, the digital manufacturing class allows students to conceive of their own ideas for practical basic technological gadgets, sketch the gadgets on paper, develop their components, and build them on their computer screens, if not necessarily in real life. The decision to offer a completely new course at any school doesn't just happen, and a course as innovative as this one was more than simply a mercurial whim on the part of an administrator. "Being a college prep school, we want to make sure we're constantly delivering on our mission, and every year we try to find something for the next year that's going to be value-added," explained SCPS Headmaster Roger Yancey. "To help us do that, about three or four years ago we implemented a questionnaire [aimed at] our graduates in colleges around the country, asking, in effect, 'How well are you prepared in English, math, social skills (coming from a Christian school), etc., and how could we have better trained you? What are you realizing you would like to have had more of here at Savannah Christian?'" The majority of the feedback, said Yancey, indicated that graduates would have liked some grounding in more advanced computer technology, and even engineering, than the school was currently offering. And this coincided with the arrival of a new math teacher to the high school faculty, someone who might be able to give this goal of fulfilling students' desire for a stronger technological grounding a real shot in the arm. When it comes to practical experience, teacher David Small is a far cry from the typical high school educator. "I was in the process of leaving the Pentagon after working there for 25 to 30 years on the missile defense system," Small explained. "I was retiring from that line of work and relocating to the Savannah area, and I'd always wanted to teach. SCPS was looking for a math teacher at the time, and this course just fit everything I really wanted to do. It fit my math background and my background in mechanical engineering. So it really fit, hand in glove." Benjamin Brown and Karan Patel work on their electric guitar by developing a mutual plan and then dividing the components up into pieces. Yancey added that, in addition to Small's practical experience, he brought with him something that can't be measured. "He's a lifelong learner. He can come in and say, 'Hey, I've done all this stuff,' but he's interested in learning as well. And he sets a great example for our students." Small said that he's been learning each semester--about the course and what students want to get out of it and about his own potential for imparting both practical knowledge and the wisdom that comes from having had a rich life and career. One of the challenges that such a course, what one might call a "pre-engineering" course, presents at the high school level is the current skill level of the students. Small said a key element in designing the course, as well as in teaching it, is always keeping in mind where the students are, both in life and in the learning process. "I'm working with students whose math background is Algebra II," Small noted, "and they may be taking AP calculus or pre-calculus at the time. They're not engineers yet. 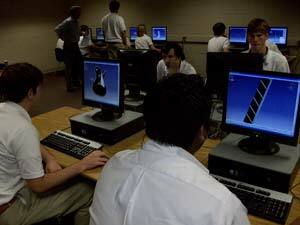 We're trying to provide them with a grounding commensurate with algebra II level training." Also of prime importance in such a course, then, are the primary teaching tools, in this case the software. It was imperative to both Small and the school that the application they use be both easy to learn and real world applicable. The engineering industry environment in the Savannah community and beyond, Small explained, made finding the right program less of a chore than it might have otherwise been. "We have several [companies] in the area that I was familiar with," Small said, "including Gulfstream Aerospace, which uses DELMIA in their professional environment." Small also had a lot of previous contact with the Georgia Institute of Technology, better known as Georgia Tech, during his years at the Pentagon. The university, which works with the Pentagon on defense technology research projects, is located about 250 miles away in Atlanta and also uses DELMIA for preliminary drawings in the research and development process. DELMIA is manufactured by Dassault Systemes, a French company with a United States base in Auburn Hills, MI, and this was another facet of the process of developing the course in which the pieces fell comfortably into place. Roy Smolky, an executive with Dassault who does development work with DELMIA, has a daughter who is an alumna of SCPS, class of 1998. The school purchased a technical support contract with the company, Yancey explained, so that it could have a place to turn with any questions the students or teacher might have. But because of his high opinion of the school, Smolky has been instrumental in seeing that the school received assistance not normally offered with a standard software license. Senior students Sam Grainger and Brandon Sumner present the components of their mechanical bull project. "On the tools side," Small said, "I have several people up there [at Dassault Systemes in Michigan] I can communicate with via e-mail who've addressed every single question I've ever asked." And "we had a Web conference with Mr. Smolky. He set it up, he talked to our class one day, and then we took a product and took it apart and put it back together." What makes the software a good fit for the course is that, while professional engineers use it to design much more advanced components, the basic application is designed for broad use, from beginners to trained technicians to technology manufacturing professionals. Small noted that it's easy to learn, but that, like a calculator, for example, its functions can be applied at all levels of education and productivity. The software, Small explained, "is a [CAD] tool that allows you to initially sketch in the 2D world, and then, depending on what you're trying to develop, you can create a 3D figure, around an axis, and then you can start to manipulate it [on screen]." As Small noted, the students are "not engineers yet." 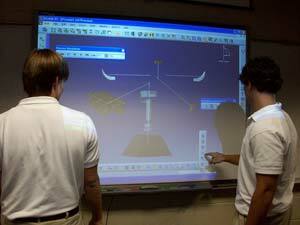 But that fact, he explained, speaks volumes about the course's value at the high school level. "From our seniors who are taking it," said Small, he received feedback going in both directions. "I heard, 'I didn't know engineering was going to be like this. I'm not sure I want to do this anymore.' And then there were others who said they were on the cusp and have now decided they definitely want to do this for a living." Both results show the impact of a class that gives kids a practical idea of what may be required of them in pursuing a career they had previously decided they wanted based solely on an abstract concept of what it entailed. Yancey also pointed to this awareness in high school as a way of narrowing students' focus once they're in college and making long-term decisions. "It whets their appetite for sure," he said. "It's not a miracle worker, but the research shows that the average college student changes his or her major four times before graduating. I think this might help keep that from happening, or at least reduce the number." After two semesters in existence, the course, said Small and Yancey, is still evolving and will continue to do so. And with all the aforementioned benefits, there have to be a few complaints as well, no? "The only thing they wish is that they could pick [the concepts and software application] up more quickly," Small said. "The learning curve starts out very slow, and then by mid-semester they're off on their own, and they come up with these amazing ideas." Ultimately, when the semester ends and the curriculum has been taught, what the students take away from the course is not so much professional training, but training for the training, an introduction to what they might tackle if they choose to take their education in technology development to the next level. For certain, some realize that this is not the direction for them, but when one introductory college course can cost upwards of $2,000, why not make this discovery in high school? Students become teachers and problem solvers for one another. For those who come away saying, "Yes, this is exactly where I see myself heading," there are even more options before the college applications start circulating. 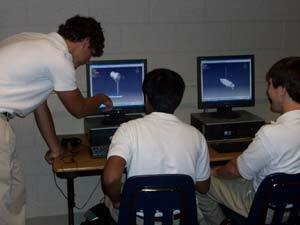 Small said that, although the digital manufacturing course is the limit at SCPS, at least for now, he makes all of his students aware of the summer engineering camp at Armstrong University in Savannah. Last year, four of his students asked him for references to include in their applications to the camp, which, as a teacher, he said he found very exciting. So what are educators really talking about when they discuss innovation? Raising awareness about exciting options for the future. Stoking interest in something besides dating, GameBoys, and Facebook. Even just teaching to students who genuinely want to learn. No one is going to overhaul the system all at once. One active effort to learn what students really want out of school, one persuasive pitch to the school board, one course that begins to expand the boundaries of what high school can mean to those it's meant to serve. Innovation in education is much like its counterparts in any other field. It begins with an idea, generating some interest, taking a few small steps. Building something.